It was a successful outing for two of Victoria’s top female basketball sides, who took to the court for their final WNBL pre-season hit-out. The Dandenong Rangers edged out a gutsy Deakin Melbourne Boomers team 82-77 at the State Basketball Centre last Friday night. Ash Grant led the Boomers with 16 points, while Rangers captain Rachael Jarry topped their scorecard with 20 points and six rebounds. New recruit Rebecca Cole had 12 points to go with her six steals as she lined up against her former teammates for the first time. Rachael Jarry closes out the game from the free throw line. Photo: Cameron Lucas. “It was very different being up the other end of the floor warming up,” Cole said. “Larissa and the coaches have made that easy, you know what your role is. They just want you to have fun, give 100 percent all of the time and have accountability for each other,” she continued. Both teams rested their star players, giving younger and newer team members valuable minutes on the floor before the season gets underway next week. 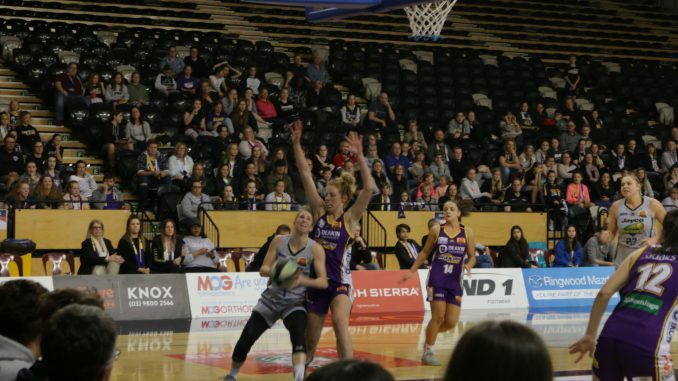 Boomers captain Jenna O’Hea was rested after returning from overseas on national duties, along with Maddy Garrick and off-season signing Ezi Magbegor. Rangers forward Sara Blicavs is nearing the end of her recovery from an ACL injury and former WNBA player with the Connecticut Sun’s Betnijah Laney sat out the game. Two different offences were on show as Boomers coach Guy Molloy opted for an isolation game style while the Rangers took advantage with their quick movement and breakaways. As the end of the game drew near, the bigger, stronger bodies of Rangers Tayla Roberts (18 pts), Kayla Pedersen (15 pts, 6 rbs) and Bree Whitman (9 rbs) brought home the win. For the Boomers, Monique Conti and Lindsay Allen partnered in the backcourt, while Kalani Purcell returned determined as ever with 13 points and nine rebounds. Her strong attack impressed, as did Jaz Shelley‘s 14-point game coming off the bench. Both teams could take plenty of positives from the game as they look forward to their season openers this week. The Boomers will host the Bendigo Spirit at 7.30pm on Friday at the SBC, whilst the Rangers will fly north to take on the Townsville Fire on Sunday at 3pm.